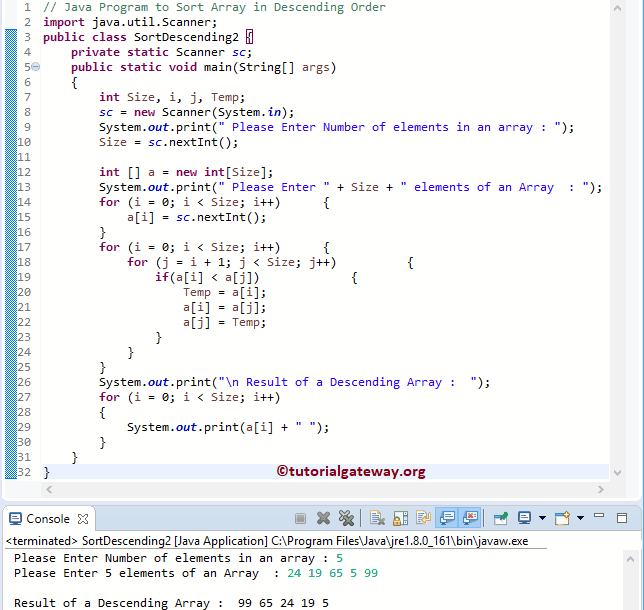 This article will show you, How to write a Java Program to Sort Array in Descending Order without using Built-in function, and using Sort method with example. In this program we are using the Collections.reverseOrder() and Array.sort method to sort the array elements in descending order. This program allows the user to enter the size, and the Array elements. Next, it will sort the array element in descending order using For Loop. The value of i will be 0 and the condition (i < 5) is True. So, it will enter into inner or Nested For Loop. The condition (1 < 5) is True. So, it will enter into If Statement. The condition (i < 5) is True. Do the same for remaining iterations until the condition (i < 5) fails. This program is same as above but this time we separated the logic to sort elements of an array in descending order using Method. In this article, we will show you, How to write a Java Program to Sort Array in Ascending Order without using Built-in function, and using Sort method with example. 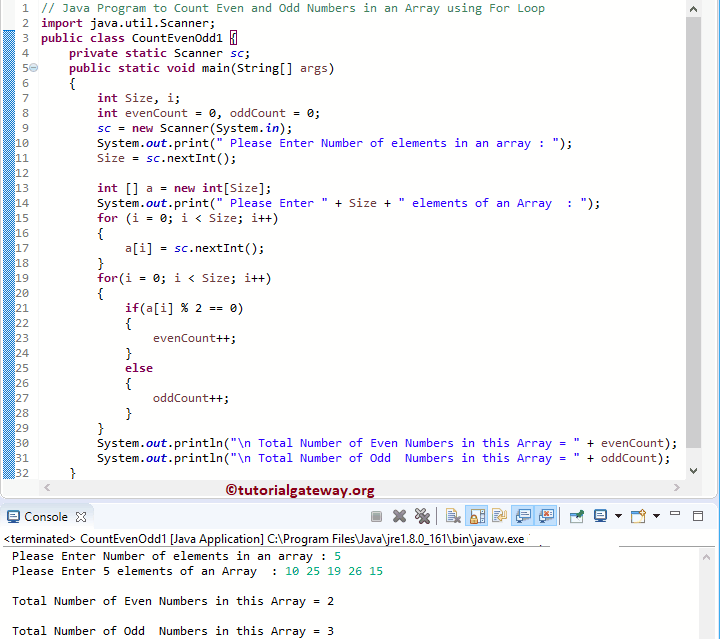 In this program we are using the Array.sort method to sort the array elements in ascending order. This program allows the user to enter the size, and the One Dimensional Array elements. Next, it will sort the array element in ascending order using For Loop. 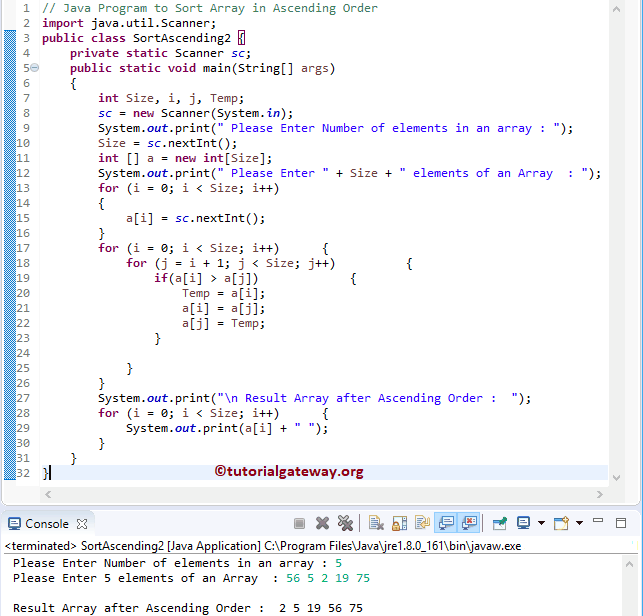 This program is same as above but this time we separated the logic to sort array elements in ascending order using Method. In this article, we will show you, How to write a Java Program to Swap Two Arrays without temp variable. Instead of using third variable, we are going to use Arithmetic, and Bitwise Operators. 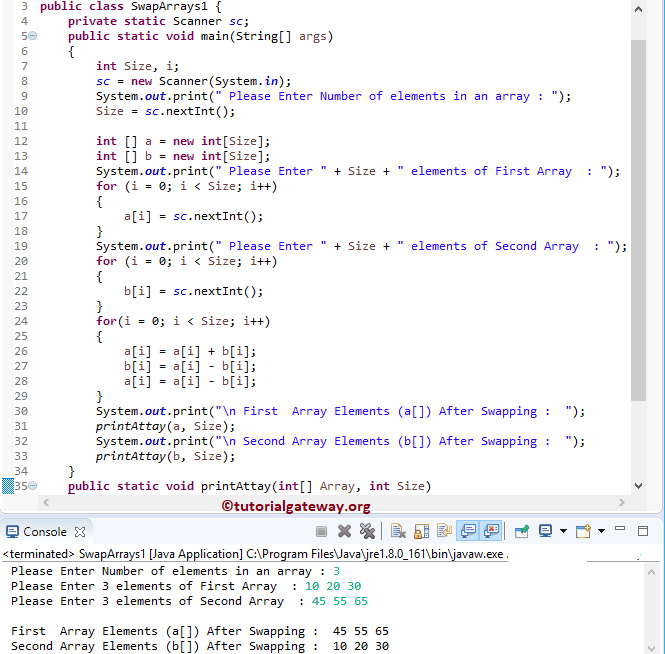 In this program, we are going to use Arithmetic Operators to swap two array. First, We used for loop to iterate each and every element. The condition (i < 3) is True. In this program, Instead of using temp or third variable, we are going to use Bitwise OR Operator. Please refer Bitwise Operator in Java to understand how bitwise operator work. This program is same as first example. Here, we separated the logic to swap two arrays using Method. In this article, we will show you, How to write a Java Program to find Sum of Elements in an Array using For Loop, While Loop, and Functions with example. This program allows the user to enter the size, and the Array elements. Next, it will find the sum of all the existing elements within this array using For Loop. 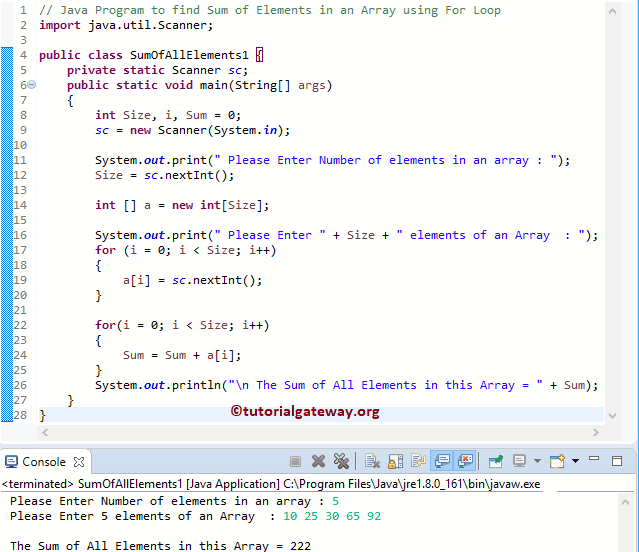 This program is same as above but this time we used While Loop to calculate the sum of all elements in an array. This program is same as first example. Here, we separated the logic to find the sum of array elements using Method. 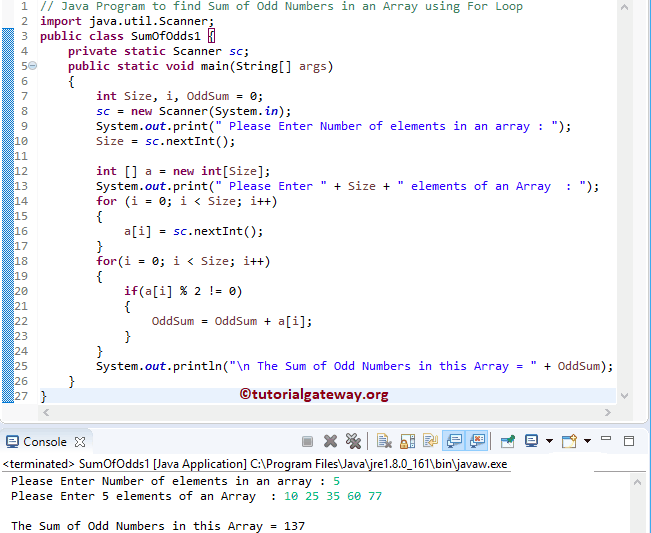 In this article, we will show you, How to write a Java Program to find Sum of Even and Odd Numbers in an Array using For Loop, While Loop, and Functions with example. This program allows the user to enter the size, and the Array elements. Next, it will find the sum of even numbers, and sum of odd numbers within this array using For Loop. Any number that is divisible by 2 is even number. If statement will check whether the remainder of the current array element divided by 2 is exactly equal to 0 or not. If the condition is True then it is an Even number, and the compiler will add the value to EvenSum. If the condition is False then it is an Odd number. Compiler will add value to OddSum. The value of i will be 0 and the condition (i < 5) is True. if(10 % 2 == 0) – Condition is True. if(15 % 2 == 0) – Condition is False. if(20 % 2 == 0) – Condition is True. 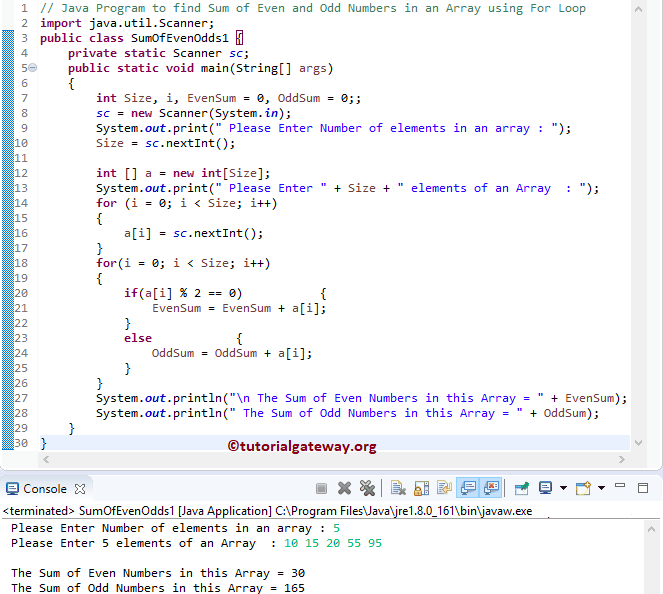 This program is same as above but this time we used While Loop to calculate the sum of even and odd numbers an array. This program is same as first example. But this time we created separate method to calculate sum of even numbers, and another method to calculate sum of odd numbers. In this article, we will show you, How to write a Java Program to find Sum of Odd Numbers in an Array using For Loop, While Loop, and Functions with example. This program allows the user to enter the size, and the Array elements. Next, it will find the sum of odd numbers within this array using For Loop. The value of i will be 0 and the condition (i < 5) is True. So, it will enter into the If statements inside the loop. if(10 % 2 != 0) – Condition is False. if(25 % 2 != 0) – Condition is True. if(35 % 2 != 0) – Condition is True. This program is same as above but this time we used While Loop to calculate the sum of odd numbers in an array. This program is same as first example, but this time we separated the logic to calculate the sum of odd numbers using Method. In this article, we will show you, How to write a Java Program to find Sum of Even Numbers in an Array using For Loop, While Loop, and Functions with example. This program allows the user to enter the size, and the Array elements. Next, it will find the sum of even numbers (or elements) within this array using For Loop. 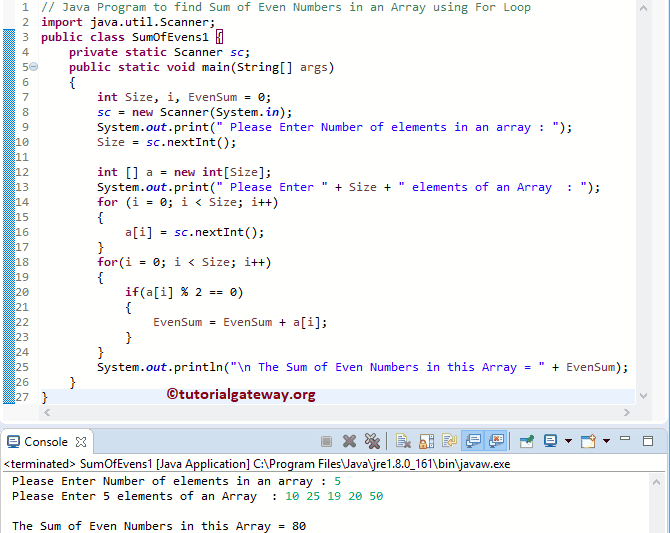 This program is same as above but this time we used While Loop to calculate the sum of even numbers in an array. This program is same as first example. Here, we separated the logic to calculate the sum of even numbers using Method. In this article, we will show you, How to write a Java Program to Count Positive and Negative Numbers in an Array using For Loop, While Loop, and Functions with example. This program allows the user to enter the size, and the One Dimensional Array elements. Next, it will count the total number of positive and negative numbers within this array using For Loop. In the next line, We have one more for loop to iterate each and every element. Within the Loop we used If statement. Any number that is greater than or equal to 0 2 is a positive number. If statement will check the same. If the condition is True then it is a Positive number, and the compiler will increment positiveCount. If the condition is False then it is a Negative number. Compiler will increment negativeCount. The value of i will be 0 and the condition (i < 5) is True. So, it will start executing the If statement. 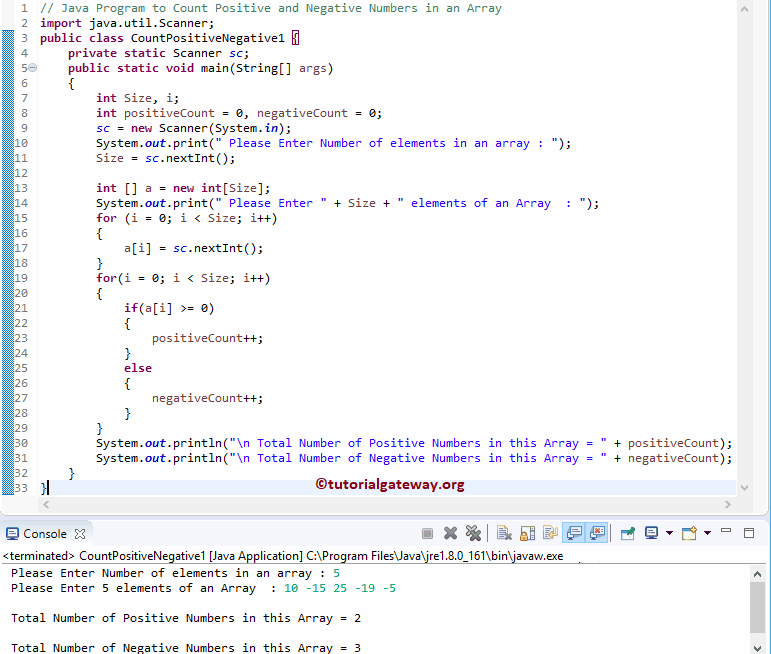 This program is same as above but this time we used While Loop to count the positive and negative numbers in an array. This program is same as first example. But this time we created separate method to count positive numbers, and another method to count negative numbers. In this article, we will show you, How to write a Java Program to Count Even and Odd Numbers in an Array using For Loop, While Loop, and Functions with example. This program allows the user to enter the size, and the One Dimensional Array elements. Next, it will count the total number of even and odd numbers within this array using For Loop. If the condition is True then it is an Even number, and the compiler will increment evenCount. If the condition is False then it is an Odd number. Compiler will increment oddCount. This program is same as above but this time we used While Loop to count the even and odd numbers an array. This program is same as first example. But this time we created separate method to count even numbers, and another method to count odd numbers. In this article, we will show you, How to write a Java Program to Count Odd Numbers in an Array using For Loop, While Loop, and Functions with example. This program allows the user to enter the size, and the Array elements. Next, it will count the total number of odd numbers within this array using For Loop. 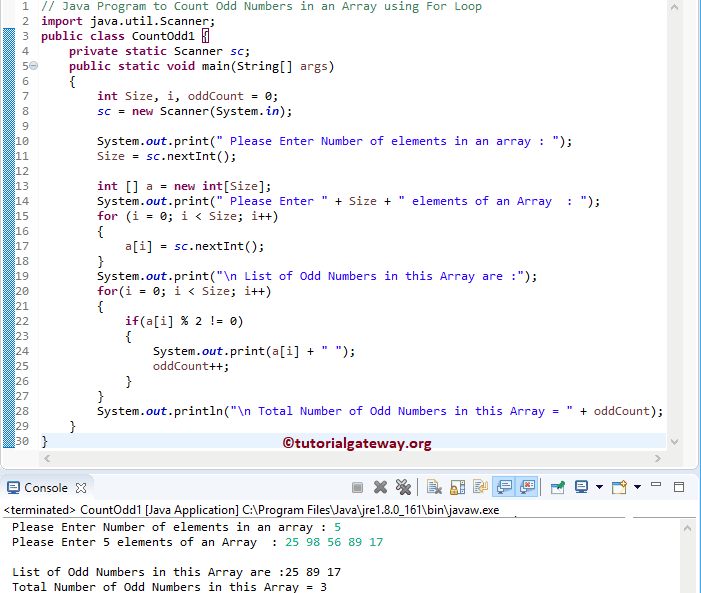 This program is same as above but this time we used While Loop to count odd numbers an array. This program is same as first example, but this time we separated the logic to count odd numbers using Method.